“If I have to fill out another 500 question security questionnaire…” This was the cry for help we recently received at RFPIO when a responder submitted a form to schedule a demo of our solution. We hear similar cries for help from responders every day. The good news is: Your security questionnaire process can be better, as long as you upgrade it. That means using a response management platform to improve efficiency and collaboration. So, we don’t have 500 reasons to upgrade your security questionnaire process. We do have 5 strong reasons though, and that should be enough to motivate you to make some amazing changes at your organization. Saving time is number one on this list of reasons…for a reason. Spending too much time responding to security questionnaires is the top challenge we hear from prospects and clients. 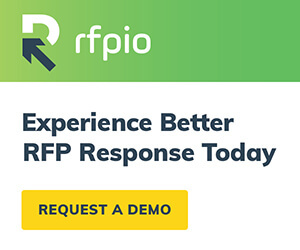 When they use a response management platform like RFPIO, they save tons of time—often cutting their response time by 40%-50%. Security questionnaires ask pretty much the exact same questions over and over again. By having them stored and ready to go within the answer library, you save time right there. Other great features are bulk answering, auto-respond, and import/export, which allow you to magically populate answers from previous security questionnaires. Then BOOM, you’re practically done. With the aforementioned features, the system takes care of the heavy lifting so humans don’t have to do nearly as much. Those humans are your resources, some of which are your organization’s most valuable (and expensive) resources…subject matter experts. The beauty with security questionnaires is actually the repetition. While this is a pain point in a manual process, repetition is ideal with response automation. These features keep you from nagging your subject matter experts (SMEs) to answer the same old questions. By protecting their time, you’re also protecting your company’s resource investments. Those same SMEs are some of the most tech-savvy individuals at your organization. In a way, they are a living database of technical knowledge. This can be a major weak point. Information is not accessible to everyone if it’s stored in someone’s head. If that SME leaves, an organization is at risk to lose that knowledge when they walk out the door. A centralized answer library helps you overcome these information silos and potential weak points. It serves as a technical database anyone can tap into. Not only is this helpful for responding to security questionnaires, it’s also useful for sales reps who constantly need to answer technical questions. They know exactly where to go for the information and they don’t have to approach a busy SME and wait for a response. The whole purpose of security questionnaires is to demonstrate that you are the partner your prospect can trust. When they’re shopping for vendors, they want to decide if you or one of your competitors is the best (and safest) option with their data. We have actually seen organizations attempt to move away from security questionnaires. They think their certifications have everything covered and they send those attachments. Instead of meeting the prospect’s security requirements, they are sacrificing trust to try and save time. But, they could save time, maintain trust, and win the deal with a more efficient security questionnaire process. Unhappiness is the product of inefficiency. Picture this: the proposal manager is chasing after SMEs for help, the SMEs ignore the proposal manager because they have to respond to the same questions, and the sales team is worried they will lose the entire deal if this security questionnaire doesn’t get done. Let’s paint a better picture. Saving time, protecting resources, sharing knowledge, and building trust will ultimately make your team happier…and way more productive. A response management platform brings everyone together, encouraging a collaborative atmosphere to knock out important revenue-generating priorities. The fact is that security questionnaires can be massive. And, they do take up a lot of time without a specific technology solution that eases the process. You might have workarounds today, but are they working for you and your team? And, will they work for you tomorrow? You’ve learned some strong reasons for upgrading your security questionnaire process. Let’s get you on the right path with RFPIO.